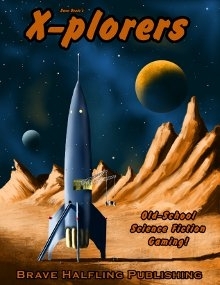 I’ve just finished a weapons, equipment and combat supplement fo X-plorers. 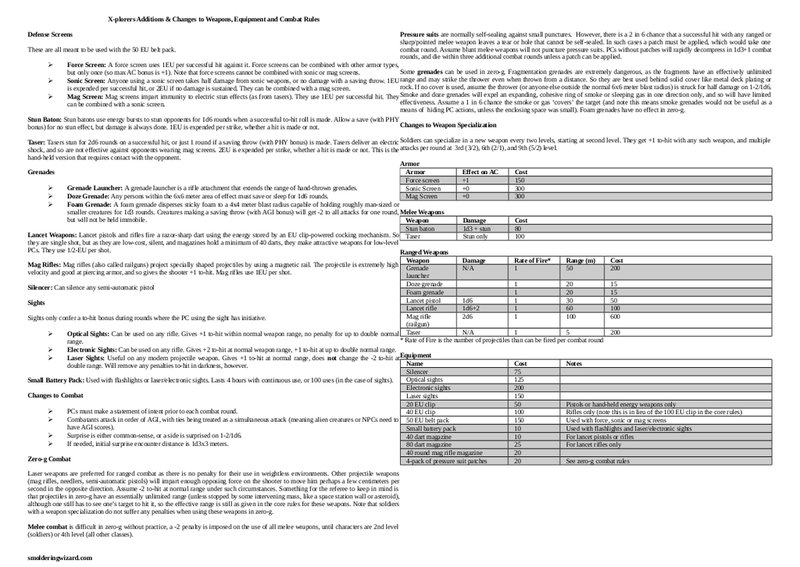 Here are the changes in a nutshell: There are some new melee and ranged weapons, two new grenades, some new equipment and rules for combat in zero-g (you may recognize the Star Frontiers or Traveller influences). I also changed the combat sequence to be more Holmesian (agility is used to determine attack order), and tweaked the Soldier’s weapon specialization rules so they can specialize in more than one weapon (one every two levels), but don’t get as many bonuses. The core rules have a force screen, which I thought should have a power source, so I added a 50EU belt pack which can also power sonic and mag screens (both new). The 100EU clip used with laser rifles is no more, replaced with a 40EU clip – I felt the heavy weapons that cause more damage needed to be scaled down a bit. You can still choose how many EU you want to expend per shot, you just get less of them. Throughout I’ve tried to keep the additions simple in the spirit of the original game. Click on the image to download or view the PDF, the text of the supplement is below (apologies that the tables did not carry over well into the post editor). Feel free to use some or all and let me know what works and what doesn’t! These are all meant to be used with the 50 EU belt pack. Force Screen: A force screen uses 1EU per successful hit against it. Force screens can be combined with other armor types, but only once (so max AC bonus is +1). Note that force screens cannot be combined with sonic or mag screens. Sonic Screen: Anyone using a sonic screen takes half damage from sonic weapons, or no damage with a saving throw. 1EU is expended per successful hit, or 2EU if no damage is sustained. They can be combined with a mag screen. Mag Screen: Mag screens impart immunity to electric stun effects (as from tasers). They use 1EU per successful hit. They can be combined with a sonic screen. Stun Baton: Stun batons use energy bursts to stun opponents for 1d6 rounds when a successful to-hit roll is made. Allow a save (with PHY bonus) for no stun effect, but damage is always done. 1EU is expended per strike, whether a hit is made or not. Taser: Tasers stun for 2d6 rounds on a successful hit, or just 1 round if a saving throw (with PHY bonus) is made. Tasers deliver an electric shock, and so are not effective against opponents wearing mag screens. 2EU is expended per strike, whether a hit is made or not. This is the hand-held version that requires contact with the opponent. Grenade Launcher: A grenade launcher is a rifle attachment that extends the range of hand-thrown grenades. Doze Grenade: Any persons within the 6×6 meter area of effect must save or sleep for 1d6 rounds. Foam Grenade: A foam grenade disperses sticky foam to a 4×4 meter blast radius capable of holding roughly man-sized or smaller creatures for 1d3 rounds. Creatures making a saving throw (with AGI bonus) will get -2 to all attacks for one round, but will not be held immobile. Lancet Weapons: Lancet pistols and rifles fire a razor-sharp dart using the energy stored by an EU clip-powered cocking mechanism. So they are single shot, but as they are low-cost, silent, and magazines hold a minimum of 40 darts, they make attractive weapons for low-level PCs. They use 1/2-EU per shot. Mag Rifles: Mag rifles (also called railguns) project specially shaped projectiles by using a magnetic rail. The projectile is extremely high velocity and good at piercing armor, and so gives the shooter +1 to-hit. Mag rifles use 1EU per shot. Sights only confer a to-hit bonus during rounds where the PC using the sight has initiative. Optical Sights: Can be used on any rifle. Gives +1 to-hit within normal weapon range, no penalty for up to double normal range. Electronic Sights: Can be used on any rifle. Gives +2 to-hit at normal weapon range, +1 to-hit at up to double normal range. Laser Sights: Useful on any modern projectile weapon. Gives +1 to-hit at normal range, does not change the -2 to-hit at double range. Will remove any penalties to-hit in darkness, however. Small Battery Pack: Used with flashlights or laser/electronic sights. Lasts 4 hours with continuous use, or 100 uses (in the case of sights). PCs must make a statement of intent prior to each combat round. Combatants attack in order of AGI, with ties being treated as a simultaneous attack (meaning alien creatures or NPCs need to have AGI scores). Surprise is either common-sense, or a side is surprised on 1-2/1d6. If needed, initial surprise encounter distance is 1d3x3 meters. Laser weapons are preferred for ranged combat as there is no penalty for their use in weightless environments. Other projectile weapons (mag rifles, lancets, semi-automatic pistols) will impart enough opposing force on the shooter to move him perhaps a few centimeters per second in the opposite direction. Assume -2 to-hit at normal range under such circumstances. Something for the referee to keep in mind is that projectiles in zero-g have an essentially unlimited range (unless stopped by some intervening mass, like a space station wall or asteroid), although one still has to see one’s target to hit it, so the effective range is still as given in the core rules for these weapons. Note that soldiers with a weapon specialization do not suffer any penalties when using these weapons in zero-g.
Melee combat is difficult in zero-g without practice, a -2 penalty is imposed on the use of all melee weapons, until characters are 2nd level (soldiers) or 4th level (all other classes). Pressure suits are normally self-sealing against small punctures. However, there is a 2 in 6 chance that a successful hit with any ranged or sharp/pointed melee weapon leaves a tear or hole that cannot be self-sealed. In such cases a patch must be applied, which would take one combat round. Assume blunt melee weapons will not puncture pressure suits. PCs without patches will rapidly decompress in 1d3+1 combat rounds, and die within three additional combat rounds unless a patch can be applied. Some grenades can be used in zero-g. Fragmentation grenades are extremely dangerous, as the fragments have an effectively unlimited range and may strike the thrower even when thrown from a distance. So they are best used behind solid cover like metal deck plating or rock. If no cover is used, assume the thrower (or anyone else outside the normal 6×6 meter blast radius) is struck for half damage on 1-2/1d6. Smoke and doze grenades will expel an expanding, cohesive ring of smoke or sleeping gas in one direction only, and so will have limited effectiveness. Assume a 1 in 6 chance the smoke or gas ‘covers’ the target (and note this means smoke grenades would not be useful as a means of hiding PC actions, unless the enclosing space was small). Foam grenades have no effect in zero-g. Soldiers can specialize in a new weapon every two levels, starting at second level. They get +1 to-hit with any such weapon, and multiple attacks per round at 3rd (3/2), 6th (2/1), and 9th (5/2) level.